Yesterday, I put out an appeal to find the game score for one of my best chess performances. Big thanks are due to Paul Runnacles, who not only found the score, but also an article by Grandmaster Jon Speelman about the game. I didn't know it had been covered nationally, so Paul's discovery was a real treat. I was going to annotate the game for you, a thematic Nimzo Indian Saemisch Variation where Black tried an unusual sequence to counter White's standard plans, but instead will give Jon Speelman's analysis and a little background to the game. The decisive action took place in the last round when Coathup, who is only rated 2130, unexpectedly defeated Crouch in the game below: while Grant won against Yugoslav Dusan Zdjelar, to share the spoils. 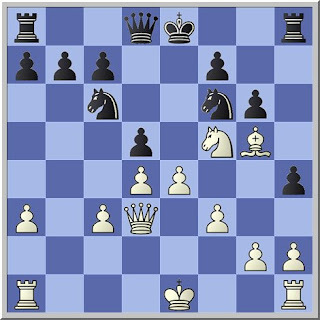 In a Nimzo-Indian, White's mobile pawn centre gave him some advantage after a dozen moves but Crouch's 12...h5 and 13...h4 and 14...g6, while thematic, simply didn't work and after 15.Bg5! Black is very close to, if not entirely, lost. 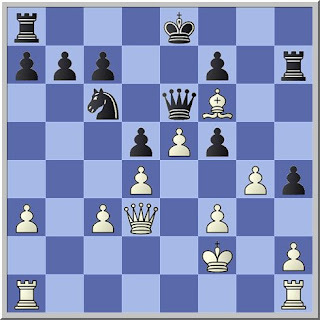 If 15...dxe4 16.fxe4 gxf5 17.e5 Nxe5 (17...Qd5 18.Bxf6 Qxg2 19.0- 0-0 is a better try but still foul for Black) 18.Qe2! White wins a piece. 19.g4! ripped open the kingside after which the admirably calm 22.Rh5 and 23.Qxf5 removed a vital pawn. With 25.Bg5!, Coathup got the bishop out of the way prior to advancing the f pawn. An impressively smooth and unharried performance against an opponent who is not only a grandmaster but also rated nearly 300 points more than the winner. An unusual move. Normally Black plays c7-c5 to pressure the White centre, but Crouch had an interesting plan in mind to swap off the light squared bishops and manouevre this knight via a5 to a strong point on c4. 8 Bd3 Bg4; 9 f3 Bh5; 10 Ne2 Bg6; 11 Ng3 Bxd3; 12 Qxd3 h5; 13 e4! For me this was the key move in the game. Black's play, albeit at the cost of several tempi, has all been directing at stopping it. If White doesn't play e4 now, Black will follow up with h4 driving back the g3 knight, and move the c6 knight to c4 dominating White's bishop. 13 e4 needed a lot of calculation though, in particular envisaging 15 Bg5 and analysing the variations (as given by Speelman) that follow. 13 ... h4; 14 Nf5 g6; 15 Bg5! (see diagram above) gf; 16 e5 Qd7; 17 Bxf6 Rh7; 18 Kf2 Qe6; 19 g4! This was my maiden Open Tournament first place at standard time limits.